6" Sandal with lace and rhinestones. 6" Heel Two Tone Slingback Sandal. 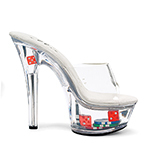 6" Heel Clear Mule W/ Dice & Poker Chips. 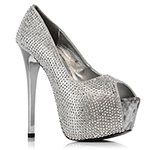 6" Heel Sandal W/Silver Rivets.